There are a number of ways to reduce saturated and trans fats while still eating most of the foods you enjoy. Research has shown that the most effective diets for long-term, healthy weight loss and developing a streamlined, muscular body are high in complex carbohydrates and lean proteins and low in saturated and trans fats. This article describes different types of fats and the foods that contain them, and provides strategies for reducing consumption of the fats that lead to obesity and health problems. Fats should make up no more than 35% of your daily calories, and preferably a bit less (20%-35% is the recommended range). The healthiest fats are monounsaturated and polyunsaturated. They can be obtained by eating nuts, seeds, avocados, vegetable-based oils (olive, canola, peanut, sunflower, soybean, corn, and cottonseed), soybeans, salmon, tuna, and mackerel. Eliminate or cut back on foods such as beef, lunch meats, whole milk, egg yolks, cheese, and butter, and cut out fast food and packaged junk food altogether or have them only occasionally. Trim the skin from chicken and turkey and the fat from beef. If you eat ground beef, choose extra lean and drain the fat off before consuming it. Braise or grill foods rather than frying. Fats add flavour, but you can make up for lost flavour by adding herbs and spices or marinating in low-fat sauces. If you do fry or sauté, use olive oil rather than butter. Buy or make olive-oil-based salad dressings rather than those with cream or cheese, and add sunflower seeds or nuts to salads instead of bacon bits. When snacking, instead of choosing high-fat junk foods such as potato chips, have nuts, peanut butter on whole wheat bread, vegetables, fruit, or baked (rather than fried) chips or cakes made from brown rice or soy. Trans fats, found in solid and semisolid margarines and other products in which ingredients are hydrogenated, should be avoided altogether because they increase the risk of heart disease. Many popular processed snacks and spreads contain hydrogenated fats, including some peanut butters. When in doubt, check the label. If you see the word “hydrogenated,” avoid the product. While the complex carbohydrates found in whole wheat bread, brown rice, oatmeal, other whole grains, vegetables, and fruits are excellent fuel for exercise and therefore promote fitness and help to sustain long-term weight loss, simple carbohydrates should be kept to a minimum along with saturated fats. Simple carbohydrates (foods containing white flour, white rice, sugar, or high-fructose corn syrup) contribute to weight gain and health problems. Fahey, T. (2005). Weight Training Basics. New York: McGraw-Hill. Mayo Clinic. (2007). 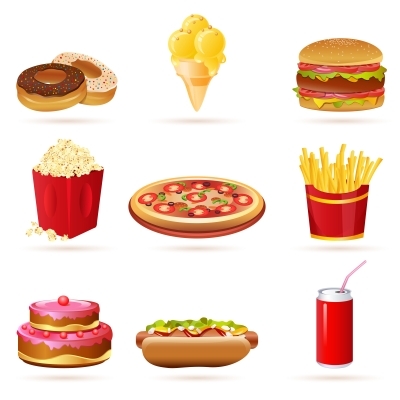 “Dietary Fats: Know Which Types to Choose.” MedlinePlus. U.S. National Library of Medicine.